Kurdish Peshmerga and Zeravani forces have been taking part in a major offensive against Islamic State near the city of Mosul in Iraq. A column of T-55 tanks could be seen moving towards the front line as they look to recapture a series of villages. The military convoy was advancing towards the Khazir front, near Iraq’s second city of Mosul, which has been one of Islamic State’s (IS, formerly ISIS/ISIL) strongholds. The plan is to capture 10 abandoned Kurdish villages, which belonged to the Kakei and Shabak Kurdish minorities. 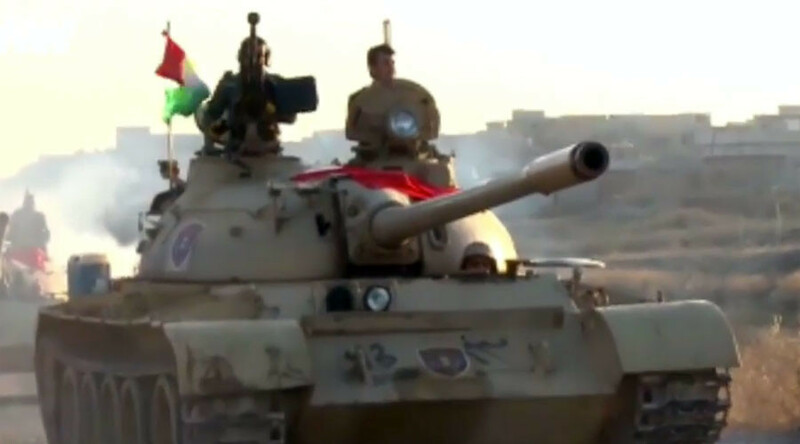 Around 5,000 Peshmerga and Zeravani special forces are taking part in the offensive, which started on Sunday, Kurdish media group Rudaw reported. The soldiers plan to split into eastern and western battle groups before carrying out the offensive. They have plenty of military hardware at their disposal, with numerous T-55 tanks, as well as modernized Humvees and American M1117 Armored Security Vehicles to use in their campaign against the terrorist organization. The liberation of Mosul has been a strategic goal of all the groups fighting IS, with the city being held by the terror group since June 2014.